The leak at hand is fairly substantial and the Microsoft Xbox One S All Digital does seem fairly straight-forward and self-explanatory of a device. At least on the surface that is. 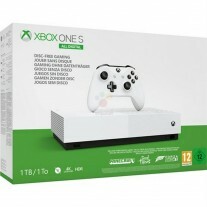 Promo materials, renders, as well as an alleged price point and release date have all surfaced online on what clearly looks to be an Xbox One S without a disk drive. Frankly, if the info wasn't quite as abundant we would have shrugged the whole thing off as a quick Photoshop joke. However, this step might just make some sense considering the current gaming climate and recent developments. But more on that in a bit. The Microsoft Xbox One S All Digital, like its name suggests, will rely solely on digital editions of games and downloads through the Microsoft Store and subscription-based content from Microsoft's growing Game Pass library. Hardware details on the new console are spotty, but the leaked images do contain mentions of 4K and HDR support, as well as a 1TB hard drive. 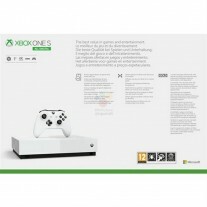 All the materials also show a white console, bundled with a single white controller, which all falls in line well with current Xbox One S bundles. Meaning that this will likely be the basic Microsoft Xbox One S All Digital package as well. Of course, other editions could follow later. Speaking of the package, the leaked box/banner art also suggests three pre-installed digital edition games. Namely Minecraft, Sea of Thieves and Forza Horizon 3. 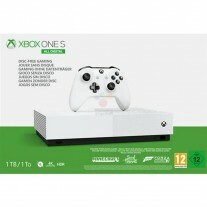 Last, but not least, the source claims a retail price of EUR 229.99 for the Microsoft Xbox One S All Digital and a launch date of May 7 in Europe. That would definitely make the Microsoft Xbox One S All Digital cheaper than the current Xbox One S, with its EUR 299.99 MSPR. Although, having said that, it is worth noting that Spring Sales are currently on and the German Microsoft store has slashed that price down to EUR 244.99. You do only get one game in the Xbox One S basic bundle, but having said that, it's not uncommon to find even better sales deals with third party retailers. Regardless, Microsoft's intentions are clear as day. Barring any surprise "killer features" potentially hidden away under the familiar shell of the Microsoft Xbox One S All Digital, it simply looks to be a solid step in a different, all-digital direction. Of course, there are many ways to look at this. Some might call it a logical move, or perhaps a reactionary one, considering all the hype around Google's potentially revolutionary new Stadia game streaming service. We won't venture too far into discussions about the current state and future of gaming, but it's clear as day that certain changes are transpiring. That being said, we would, however, love to hear your opinion on the matter. Do you like the all-digital/streaming direction things appear to be heading and the ease of use/cross platform benefits and potential hardware savings that might bring about? Or do you take issue with introducing even more subscription DNA into a gaming word already ravished by micro-transactions? Its not stupid its a good idea but people dont see the forest because of trees.